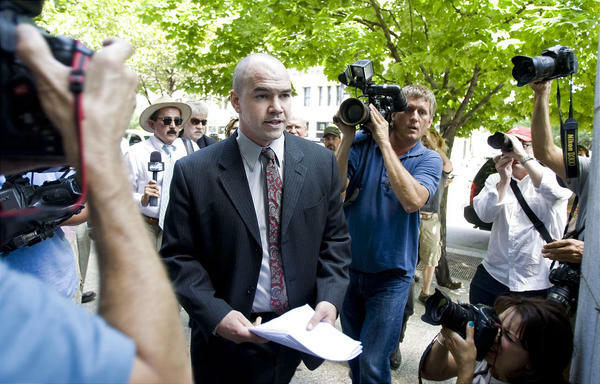 Tim DeChristopher arrives at the Federal Courthouse in Salt Lake City for his sentencing July 28. In July of last year, I interviewed Tim DeChristopher – a 30 year-old activist from Utah who had been charged with the crime of posing as a false bidder (Bidder 70) at an auction that was leasing more than 100,000 acres of federal (i.e. public) land for oil and gas development. DeChristopher won the right to develop 22,500 acres of land for which, of course, he had neither the capability nor the intention of doing. His goal was simply to take the land out of the hands of oil and gas companies. DeChristopher was convicted of the crime in March of this year and, just last week, he was handed his sentence: 2 years in jail and a $10,000 fine. The punishment was less severe than it could have been but, all the same, he is off to prison for trying to protect public lands from being exploited by the oil and gas industry. Leases for these lands, which were approved in the dying days of the Bush II Administration, were subsequently canceled by the Obama Administration. Maybe it’s also time for the rest of us to think about stepping it up in our own way. Letter writing, protests and international conferences just don’t seem to be getting the job done and are not commensurate with the urgency of the task at hand. Politicians and industry leaders still don’t seem to understand the scope of the problem or, worse, they do understand but still refuse to act. Could Tim’s actions be the catalyst for a resurgence in non-violent, civil disobedience in our country as well? What will future generations say that Canadians contributed to the climate justice movement? How will we help to turn the tide against the powerful, grotesquely wealthy and immensely destructive fossil fuel industry? Our government is clearly not prepared to take any serious action but what can the rest of us do? Remember, two pipelines are in the works to transport crude oil from Alberta’s tar sands to the west coast of B.C. and the Gulf of Mexico. If built, these pipelines would mean a dramatic increase in the production of tar sands oil and, consequently, in greenhouse gas emissions as well. In a few weeks, supporters of tarsandsaction.org will be gathering in Washington DC for two weeks of civil disobedience against the proposed Keystone Pipeline to the Gulf of Mexico. If you’ve been thinking about laying it on the line, maybe the time has come. Check out ClimateDirectAction.org for more info.